A recording by Bennie Green, the Chicagoan trombonist, not to be confused with Benny Green, the pianist. 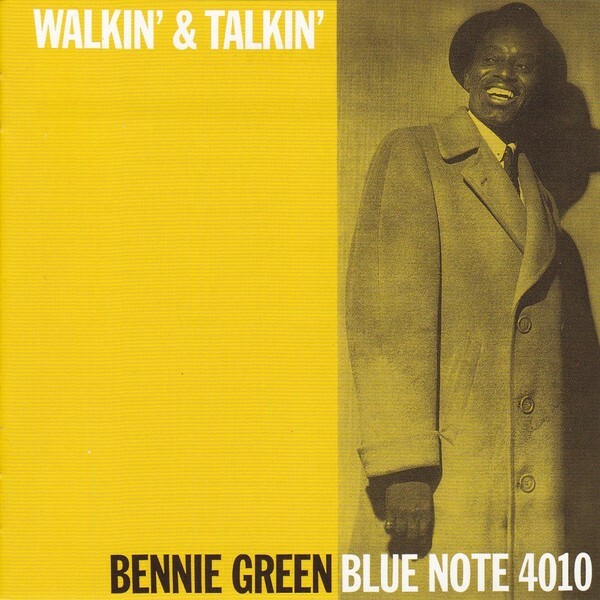 Bennie reached his career peak with Blue Note, including the last but one Blue Note 1500 series, BN 1599 Soul Stirring recorded just six months previously, and BN 1587 Back on The Scene, sporting the same hat and coat as the original Walkin’ and Talkin’ cover. A hard-driving exuberant player, Green originated in ’40s big bands, playing alongside Parker and Gillespie.. His trombone is forceful rather than silky, and partners well with like-minded big gritty tenor, in the best Chicago fashion. I don’t think I have heard front line bop-trombone live, if I had, I dare say I would remember it. It moves a lot of air. A curiously flexible instrument, the trombone can be played tunefully in a linear bluesy fashion like Green and another favourite, Curtis Fuller, or liquid gold like JJ. Or in the hands of someone Grachan Moncur III or Roswell Rudd, turn into a menacing harbinger of free and unsettling tonality, malevolent thunder in the air, full of menace. All from a long piece of brass tubing. Remarkable. Every one swings, especially Gildo Mahones, who was at one time Lester Young’s regular pianist, and Eddie Williams, an old school tenor who feels quite at home in unison with Green, grinding balancing harmonies on the right channel to Green’s solo on the left. An altogether bright, likeable album. Bell-bottoms alert! Alternative youth-oriented boy/girl dating cover. First issued in stereo by Liberty, judged by the patented new LJC system of Dating Record Covers according to the width of trouser flares, probably around 1968, at a pinch, 1969. Blue Note’s original first cover shows Green in shades of yellow,for the benefit of our colour-blind readers ( I know some are). Bennies’ coat dates from around 1956, and the hat a popular item for several decades but of a style not much worn in the late ’60s. See LJC Multi-Decadal System for Dating Records according to Hats ™, currently in beta. BLP 4010 was originally released by Blue Note in February 1959, in mono only. However it was recorded three months after van Gelder had moved to recording only in two track tape (cue DGMono), so I was fairly confident a stereo recording of 4010 existed. As it fell within the window of true stereo I naturally assumed it was a safe choice, so my heart sank when I spied the words electronically rerecorded to simulate stereo on the back cover, refered to by the Ebay seller simply as “stereo”. Everything I knew about “fake stereo” says b a d. Resigned to the worst, the record was duly mounted the turntable, before despatching it back to the ebay seller with a sharply-worded note about the difference between true stereo and fake stereo. What then transpired was something unexpected. In the topsy-turvy world of making and selling records, not everything that claims to be fake is fake. Now I’m no expert on sound engineering (said quickly, leaving a door open to back out in case of inevitable argument). I have heard some pretty horrible examples of recordings reprocessed for stereo – high and low pass filters to separate off bass and cymbals, reverb and timing mismatch on one channel, all the tricks of stereo-fakers. What I hear here is clean separation and placement of instruments, reasonable soundstage, pretty well just stereo. If anything, a lot more listenable than some of Rudy’s primitive stereo. So what does electronically (redundant word, all recording is electronic, ) re-recorded to simulate stereo actually mean? With some early van Gelder recordings, made on full track mono, there was no option but to perform electronic tricks. Here a two-track tape certainly existed. In the absence of an RVG STEREO master ( 4010 was never issued in stereo) perhaps Liberty engineers simply re-mastered it from Rudy’s two-track tape, doing what engineers sometimes do along the way: try to improve it. Perhaps “re-recorded” means something different to “re-processed”. Why simulate stereo if you have effectively got a two-track recording? The answer to that may be that by 1968, there were a lot more tools in the engineers box, and maybe a van Gelder two-track recording destined only for mono mastering needed things done to it. The interesting thing about the vinyl run-out is the absence of engravings, anonymous, merely the catalogue number. Connoisseurs of Liberty Blue Note pressings will also note the label colours are cream off-white, the blue with a cyan bias, pointing to later Liberty manufacture. Not Blue Note’s Keystone Printed Specialties, Scranton, PA. Taken with the bell-bottom trousers, I confidently assert 1968. Liner notes and pictures direct from the original BN 4010, plus the usual Liberty hallmarks, Liberty Records Blue Note logo, and fateful stereo warning. It’s fake fake stereo to me, and no bad a thing at that for a 1959 recording. All discovered by accident, of course. The experience led me to re-evaluate the few other electronically re-recorded Blue Notes sitting in the LJC records sin-bin, with some more considered judgements. More in future posts, hugging the mono-stereo curve. Am I wrong? No doubt the usual suspects will try to call me out. Bring it on. The Prestige Research Project has proceeded well, thank you to the brave thirty two readers who have contributed data on their collections. And thanks to the tireless effort of Diego in the basement shovelling data. In return contributors get advance previews, the lurkers can wait. If any want to contribute data on their Prestige NYC collection , it’s still open. The project has taken time away from regular blog posts, I can’t do both, so posts will continue be a little infrequent. Some people might consider that a good thing. But I’m not going away. Normal (i.e.poor) service at LJC will be resumed as soon as possible. We have firm conclusions on Prestige first pressing status in the offing, some unexpected twists and turns along the way. It will still take some time to assemble the final product, and there is a lot of work still to do. One thing that has come up is a previously unknown engraving that turns up on titles in the range 7131 to 7139, described mostly as hand-etched “8J”. 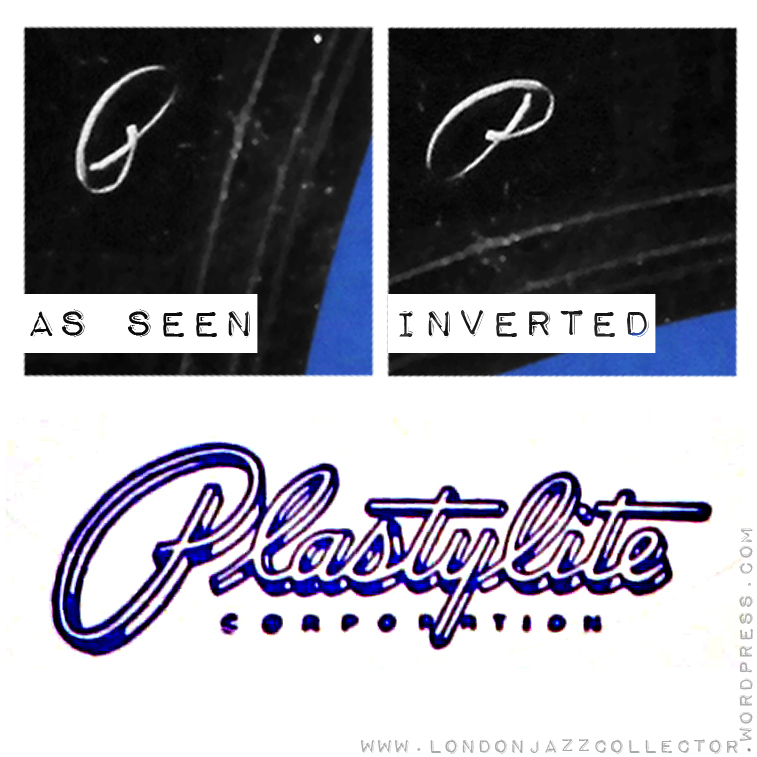 Blue Note aficionados will know that the Plastylite ear (P) is horizontally and vertically inverted letter P.
If you were a normal (right handed, I assume) pressing plant operative, and you had a scriber to write a code onto the acetate/master, where would you start and finish the strokes to make the character 8, J, or 5? . All ” 8 J”s I have on my Esquires all have the curve of the “J” turning down, not up as in the true letter J. Any theories what this etching means means? Budding graphologists, is it an 8J or an 85 code? Pressing plant? It is not found on AB pressings, and it is not like 7E. It appears only on around ten records whose release coincides with the move to Bergenfield, N.J. and the last NYC labels. If my theory is right, that it is an 85, at which stage in manufacture would it have been applied to end up on the record as backward? Acetate positive, mother negative, stamper positive, record negative. The floor is yours. 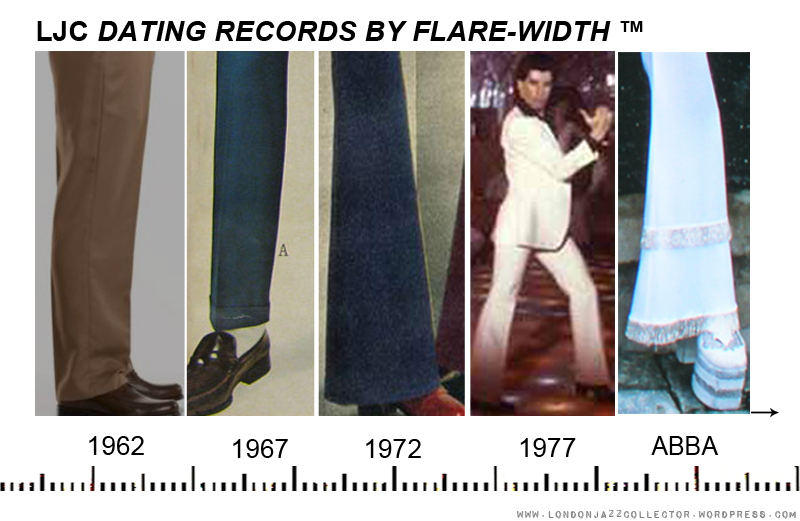 If you want to contribute data on the flare width of old bell-bottoms in your loft…be off with you. 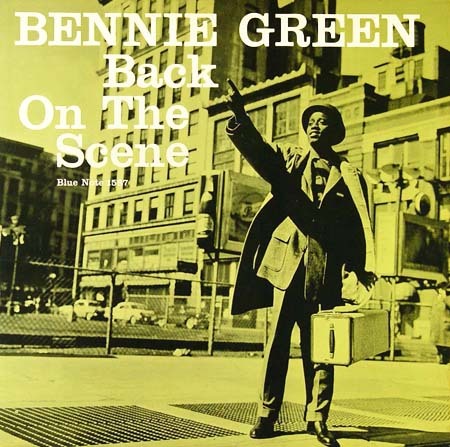 This entry was posted in Bennie Green, Blue Note, Liberty and tagged Al Dreares, Bennie Green, Blue Note, Eddie Williams, George Tucker, Gildo Mahones, Liberty, Stereo by LondonJazzCollector. Bookmark the permalink. 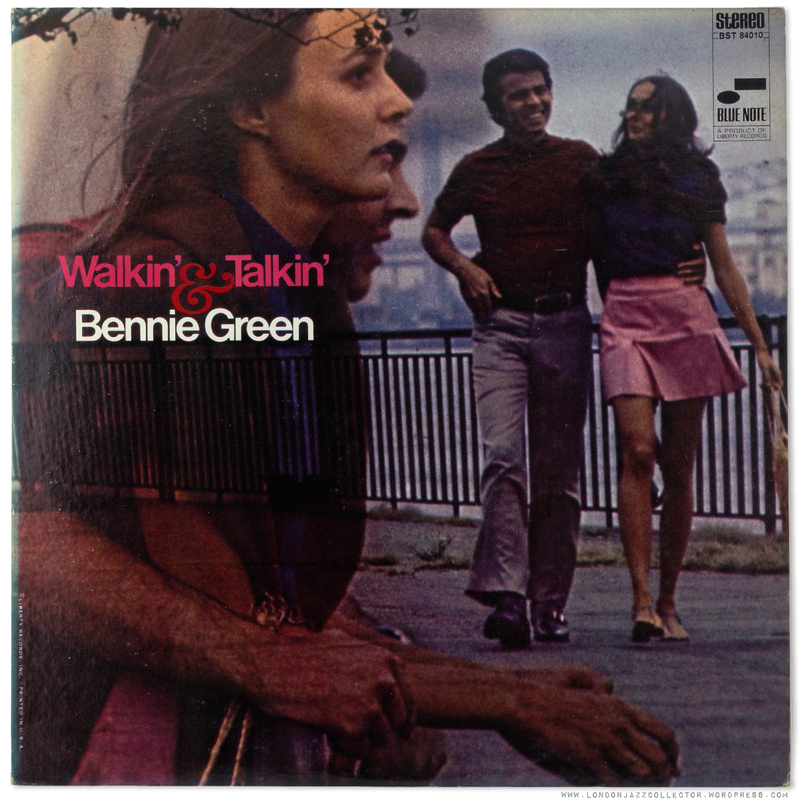 I picked up the same Bennie green reissue a while back and like you was surprised to hear ‘real ‘ stereo. I also have a Kenny Burrell blue lights 1596 reissue marked “electronicly re recorded to simulate stereo ” that is ‘real’ stereo as well. There is no meaningful inference you can draw from the various verbiage’s labels applied to fake stereo. Re-recorded just means they took the original, processed it, and recorded the results back to tape. The only Blue Notes I have that are reprocessed are Monk and Davis. And it’s true that sometimes the labeling as fake stereo does not mean fake stereo. For small labels, especially, the expense of making fake stereo would be unwanted; yet jobbers and distributors from the mid-60s didn’t want mono recordings because customers were switching to stereo; by the late 60s, some wouldn’t even take them. So in some cases, they just redid the covers. Shops felt “reprocessed for stereo” was a selling point and would give re-releases display space. In the case of Prestige, all the “repackages” they did in the mid-60s say Remastered for Stereo or Remastered for Stereo from Mono Originals but as mentioned some are Van Gelder mono plates. I’ve seen fake fake stereo from Sun too. By the 1970s, the move was back to mono. I’ve got a mono Rolling Stones Now! in a reprocessed cover dating to the late 70s, for instance. Another good theory goes up in smoke. That looks bona fides 8J. May be the left-handed engineer was on that day? Yeah…on second thought, on the other LP the 5 looks pretty strange too. unsurprisingly I have the same 8 J on both sides of my yellow/black N.J. pressing. in order to avoid fake/stereo questions I enjoy my 4010 in mono, strictly original. LJC, I think this “electronically re-recorded…” note on the back cover was just a plain mistake. There’s nothing special about this LP in sonic terms, it sounds much the same as the stereo versions available on CD or… (excuse me) in the shape of downloads. If they had intended to do the kind of sonic voodoo done on other occasions then it would sound very different. It’s a pretty good stereo Blue Note, that’s all. perhaps they just got lazy when printing the new covers? as a strict original devotee, i wouldn’t touch it with a ten foot pole either way, but these things are neat to know. hats off. i am no graphologist, but that is an extremely bizarre way to write a J. my vote is for 85. As a budget collector i have quite a few rechanneled/rerecorded/reprocessed stereo albums on BN & Prestige. Most of them are true stereo or what sounds like true mono, some even have Van Gelder stamp (hard to believe he dealt with fake stereo). The few which are clearly fake stereo are put aside, however they are not many at all. So, it seems that the connection between what is printed on the cover to the pressing itself is quite often very loose…with BN i think that if an album was ever released in true stereo every stereo pressing of it will be true stereo, no matter what it says on the sleeve. I highly doubt that Van Gelder would have taken part in any type of faux-stereo mastering. But I think you might be right, that if a two-track tape existed the ’70s reissue would be true stereo…maybe in some rare instances the two-track existed but they still made a faux-stereo master…? Skunkride, Could you tell me if the Van Gelder stamp is only on the rechanneled lps? I can see him splitting a two track mono session into left/right channels but not any of the fake reprocessed releases. BTW no Van Gelder stamp on the “electronically re-recorded to simulate stereo” Blue Note titles, although the ones i have are mostly (not all) true stereo & sound great. If you’re hunting for Prestige titles, look for the twofer 2400 series released on the green label. Many of them surprisingly have Van Gelder stamps and sound amazing. The Sonny Rollins twofer has a Saxophone Colossus with a VG stamp! I have the Kenny Burrell “All Day Long and All Night Long” twofer also with Van Gelder on both lps. I have a Promo of the Kenny and although it’s stamped stereo it’s definitely a mono master. Have some of them, excellent sound quality indeed. Never bothered checking the matrix for RVG.. Many of the early ones credit Van Gelder for remastering on the inner gatefold, but you have to check the deadwax because later pressings use different cuts (those these are often nice too). So, in the terminology used by Blue Note at that time, “electronically re-recorded to simulate stereo” means “This is a recording with genuine channel separation, but we are well aware that true stereo would mean much more than that, and we have been doing our very best to make it sound like a decent stereo recording rather than fake stereo”. 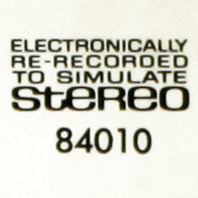 It is the word “simulate” that makes one wonder initially what they really meant, but they may have been too modest to apply the term “true stereo” to a simple two-track recording. On the other hand, the Prestige titles that were “electronically remastered for stereo” are genuine fake stereo, as it were. Ecxept those with an RVG stamp (read Rich below). These are true mono. I think it’s as simple as a mislabeling. The label indicates that it’s faux-stereo but it’s true stereo. 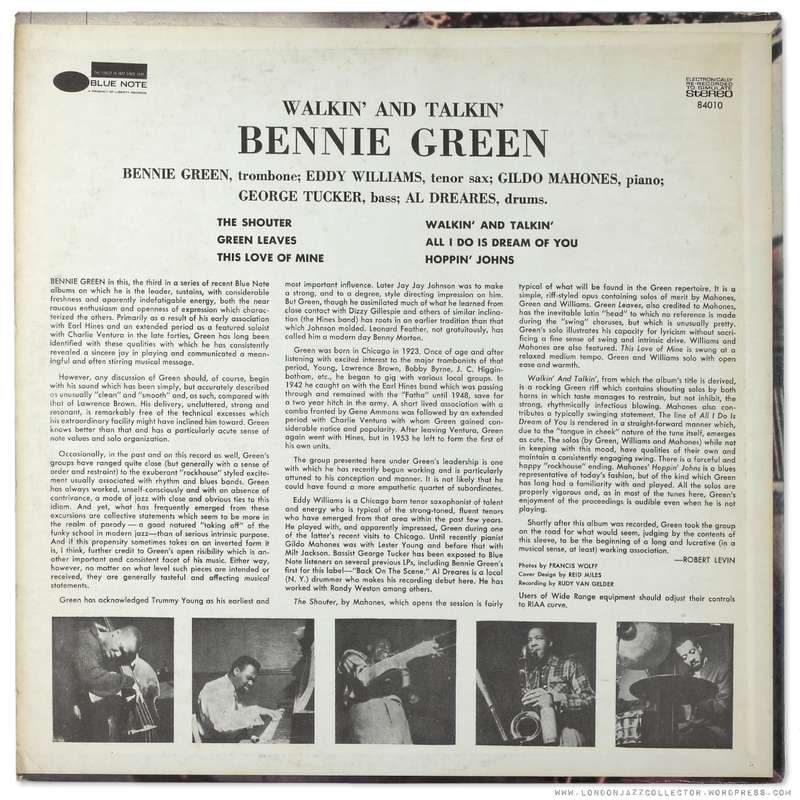 I’m pretty sure when the majority of us throw around the phrase ‘true stereo’ we mean precisely what can be heard on this Bennie Green disk: simply authentic channel separation, not some sort of advanced, fuller sounding stereo…well that’s what I mean when I use the phrase anyway. It appears that Prestige reissues marked stereo with the Van Gelder stamp may actually be true mono. Can you confirm this, Skunk? Surprisingly, according to a recent purchase by a Hoffman member as indicated in the thread linked to above, Van Gelder apparently has done some faux-stereo mastering…see the link above. Van Gelder stamp and, according to a rather detailed description of what the owner hears, faux-stereo. What that Hoffman member hears is “a subtle difference…when toggling the mono button on and off”, and he also says, “When the mono button is engaged it folds perfectly to mono with no artifacts”. It almost reminds me of faulty azimuth adjustment on a tape machine. I think the phenomenon described is way too “subtle” to be called fake stereo. Why would RVG take the trouble if the average listener would never, ever notice any difference to mono? Anyhow – if the labeling was done with RVG’s permission then this is what fake stereo à la RVG sounds like. I’m the one that posted about my experience with the “stereo” Soultrane over on the Hoffman forum. It could be a faulty azimuth adjustment on a stereo deck playing back a mono tape as it is pretty subtle. Either way it sounds great without any of the typical all-the-bass-on-one-side-all-the-treble-on-the-other found on fake stereo albums. Also, has anyone seen the tiny DW stamped in the deadwax on any RVG cut Prestige albums? I’m glad you share my suspicion about that “stereo” Soultrane. I don’t think it really proves that RVG himself ever went in for this kind of trickery. As for that DW, I can’t help because the number of RVG cut Prestige albums in my collection is very small, and none of them has it. They are all mono, by the way. Curious about Miles Davis v1 and v2 in “electronically reprocessed” form. Do you have these on Liberty or solid blue? True fake stereo, or mono? LJC: thank you for your update on the Prestige project. The community is waiting for this important event. Not with impatience, since almost 60 years have passed before some light is shed on this fantastic label. So we have all the time. Regarding the 8 J question, I think the answer can only be given by American readers, since Americans write numbers in a particular way. 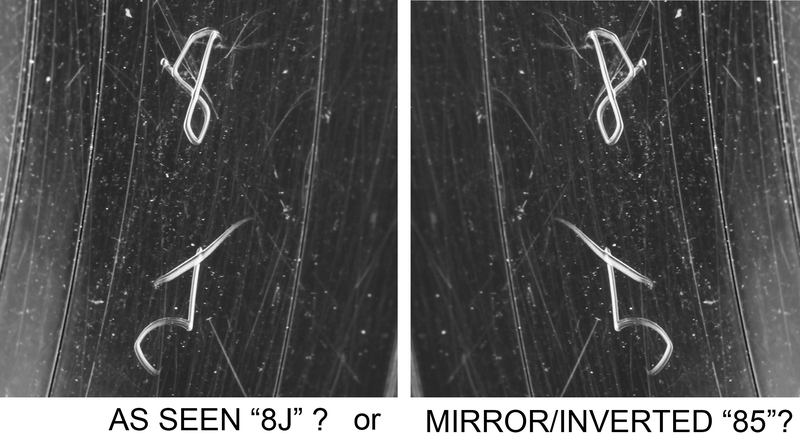 They start to draw the eight in the way, which corresponds with the “as seen” configuration, to be confirmed. I had forgotten there were two Bennie Greens — well, only one, really, because the other Bennie Green is Benny Green, but you know what I mean — so when I saw this i thought that LJC had finally cracked under the strain. But no, I rather enjoyed it. And surprisingly there are a staggering number of good trombonists (search for ‘jazz trombonists’ and see the Wiki list). At the moment I tend to regard trombone as an added extra — if there’s a trombone on a record then I’ll buy it because you’re getting more brass for your money, as it were. But perhaps that should be my next project — collecting jazz trombonists. Anyway, one of the jazz trombonists I have most enjoyed recently is the Italian Gianluca Petrella, who plays sometimes with Enrico Rava (he’s on THE WORDS AND THE DAYS, and EASY LIVING and TRIBE) and he produces the most sophisticated and enjoyable sound, rich with slurring, growling accents…. I’d always suspected my copy of Jackie’s Bag BST 84051 is not “electronically re-recorded to simulate stereo” at all. Like the Bennie Green, this has the same label and runout characteristics and I have to say it sounds pretty good too. Definitely sounds like true stereo, good find! So funny how in instances like this they ‘undersold’ true stereo with logos like the one on this record. I think you were the first person to get me thinking about whether or not jackets with this logo that were originally recorded at Hackensack were actually true stereo in the event that a two-track master tape exists. Rest assured though, albums recorded before May ’57 are definitely fake stereo. After that I’m guessing it’s a mixed bag…? None of my Blue Note Liberty or UA reissues have the above logo on them. If they were recorded to full-track tape I have the UA mono. The stereo reissues I have are all from the later Englewood Cliffs era and all are cut from original RVG stereo masters. So coincidentally I’ve never even been intrigued enough by a ’70s reissue with the stereo logo above to investigate whether or not it’s true or fake stereo…I think the only title with this logo that I really wish wasn’t reissued in fake stereo but must have been because it was only recorded in mono is BLP 1541, Lee Morgan Sextet. For whatever reason, every other late ’60s or ’70s stereo reissue I have has the original “STEREO” in all caps inside the Blue Note logo and is indeed true stereo. I recently took a two track cassette recording…track one gtr, track two vocals…and copy/pasted track two, to create two vocal tracks. Track three was ever so slightly time shifted, so the two vocal tracks were then slightly out of sync. Panned the two vocal tracks hard left and right, and viola, fake stereo. I hate to admit it, but it sounded pretty good, quite full and to the untrained ear, stereo. Heck, how many people can actually define what stereo playback is, anyway? To me, everything that was recorded to two or more tracks, with at least two microphone positions, can be used to create some kind of “true stereo”. Fake stereo uses mono recordings as a basis. So, Shirakawa, your product isn’t exactly fake stereo, it’s more on the “true stereo” side IMHO. Thanks…I think it’s somewhere in-between!